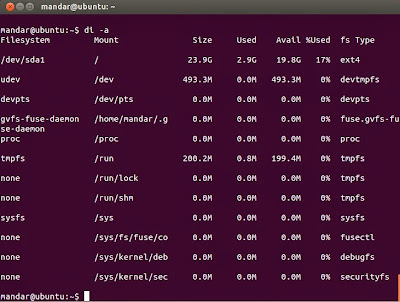 Check Disk Usage Stats For File Systems with 'di' Command in Ubuntu Linux ~ Your Own Linux..! Monitor and Analyze the Disk Usage Stats with Linux Command: "DU"
In this article, we will see a new command 'di' that has the same function as that of 'df' command and 'du' command along with some advanced features. 'di' stands for 'Disk Information' and it has all the features supported by the well-known 'df' command, hence can be considered as an alternative for 'df' command. 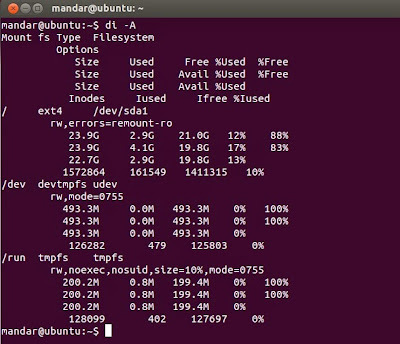 If you observe and compare outputs of 'df'' command and 'di' command, you will find that there is an extra column of 'Total Size' of the file system in the 'di' command output. So, without much a do, lets jump to the tutorial part of this article. When 'di' command is executed without any options and arguments, it will produce an output which is easily understandable by a human being. It uses notations like 'G' for gigabytes and 'M' for megabytes. It is definitely better that the 'df' output which displays the disk space usage in terms of number of data blocks occupied. When di command is used with option -A, it displays mount points and special devices names at full width. When 'di' command is executed with option -a, it displays information about all the currently mounted devices. When 'di' command is used with option -c, it prints the output with comma separated values. 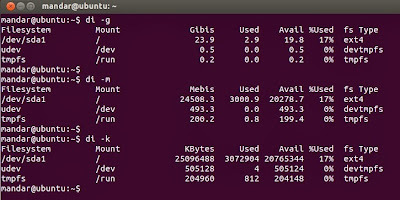 If you run 'di' command with options -g, -m and -k, you will get disk usage information in Gigabytes, Megabytes and Kilobytes in the output respectively. 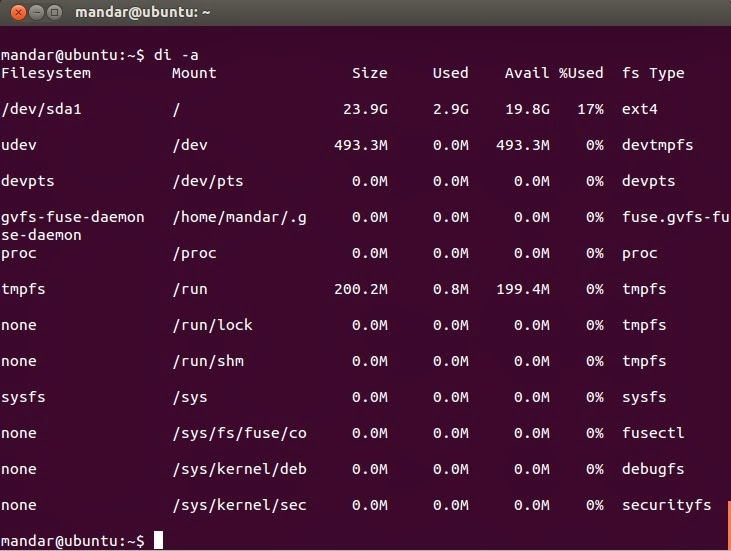 When you wish to observe disk space usage stats related to a specific file system, you can use 'di' command with option -I and file system type as an argument. When you are parsing the 'di' output, you may not want to print the header line in the output. This can be achieved by executing 'di' command with option -n.
You can add an extra line in the 'di' output specifying the total disk space usage information by using option -t.
That's all. You can always refer to manual page of 'di' command by entering man di in the terminal. For any feedback, use the comment section below and stay tuned for more articles on Linux Commands. 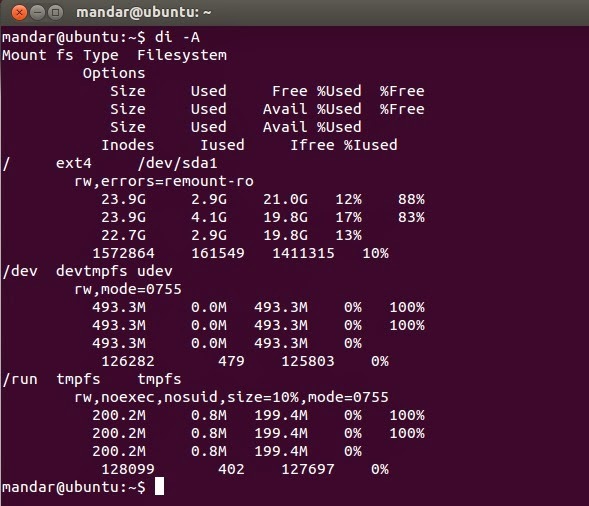 di is *not* exclusive to Ubuntu. It just happens to be built into the standard set of utilities. di can be installed on a variety of distros. I'm using arch and it's available from the extra's repo.